Hank Marvin Also known as Hank B. Marvin, is an English multi-instrumentalist, vocalist and songwriter. He is best known as the lead guitarist for the Shadows, a group which primarily performed instrumentals and was the backing band for Cliff Richard and subsequently for Marvin, Welch & Farrar. Hank uses a clean guitar sound with a Vox amplifier and often used significant amounts of reverb and/or delay effect for songs like "Apache" and "Wonderful Land". He also developed a distinctive way of using the guitar's vibrato to give a "dreamy feel" to his playing, and is recognizable for his Buddy Holly style glasses Many leading British and Canadian rock guitarists cite Hank as an influence on them. 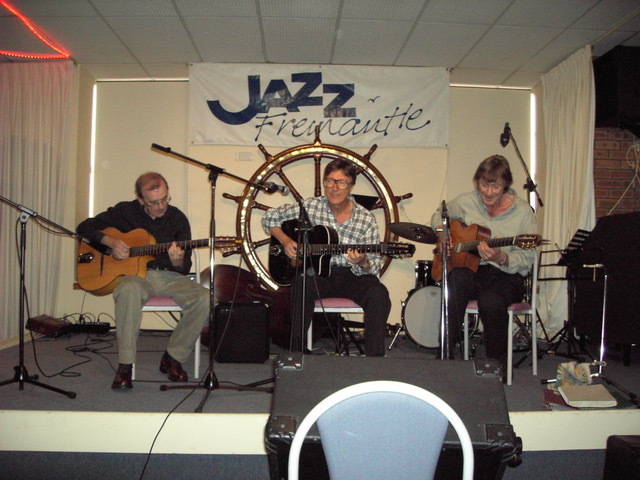 Hank has made his home in Perth since 1986 and for the last 20 years or so and has become a disciple of Django Reinhardt's music. Hank has always been a perfectionist regarding his music and his love for gypsy music is no different. He has become so adept playing gypsy jazz he has played with many of the world's best and has also formed his own gypsy jazz group. Hank has generously played with his group in many of our JGSWA fundraising concerts at Jazz Fremantle since 2005.